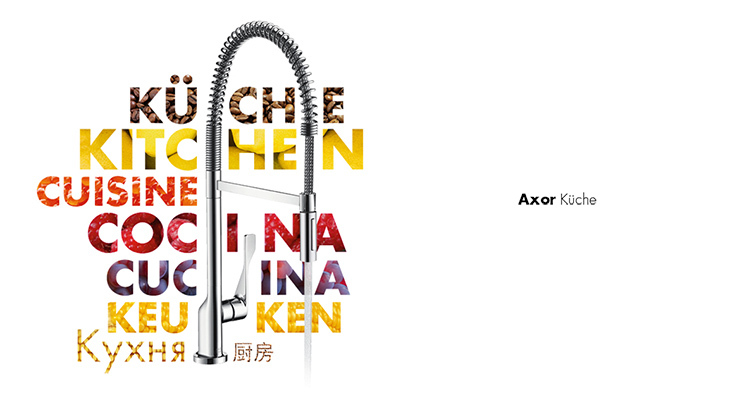 AXOR kitchen mixers – haute couture design for ambitious chefs. Developed in collaboration with the AXOR designers and designed to offer long-term satisfaction. AXOR kitchen mixers are robust, technologically sophisticated and durable. Just what is needed for the most frequently used device in the kitchen. AXOR kitchen mixers offer high-end functionality, for example hand sprays with two jet types or freely-positionable handles. With swivel ranges of up to 360°, they guarantee freedom of movement and ergonomics at the sink unit – as well as being design icons for your kitchen. AXOR Starck offers four functional mixer versions with characteristic joystick operation. The versions with swivel spout or hand spray with two jet types provide a large operating radius, with ample freedom of movement at the sink. With a 360° swivel spout, the AXOR Starck Semi-Pro variant is ideal for double sinks and island solutions in the kitchen. The practical details of the elegant, highly functional AXOR Citterio kitchen mixers make them particularly impressive. The ergonomically shaped handle is easy to operate, even with soapy hands. An adjustable swivel range creates added clearance at the sink unit, and the variants with hand spray further increase your range of movement. In the Semi-Pro kitchen mixer, a stainless steel spring makes the spout extremely mobile. Both AXOR Citterio M kitchen mixers feature a high spout with individually adjustable swivel range. The versions featuring a hand spray also offer two different jet types: normal and shower spray. The separate lever handle can be installed wherever required in the area around the sink – to suit your own personal requirements and habits. The AXOR Uno² wall mixer for the kitchen features a practical telescopic spout, which can easily be extended and swivelled. For greater freedom of movement at the sink. Or you may opt for one of the two upright models with a 360° swivelling spout. All mixer handles can be positioned on the right-hand or left-hand side.